Konstruct has a proud history of providing iconic, quality clothing and promotional products for New Zealand businesses, schools, sports teams and event organisers. Konstruct has shipped over 1,000,000 apparel and promotional product units throughout New Zealand. Our in-house production capacity exceeds 720,000 screen print and embroidery impressions per year. Konstruct has a dedicated Auckland production facility which consists of 80 sqm of office space and 500 sqm of dedicated factory floor. We use a range of methods to brand clothing and promotional products. Check out how we do things below. What it is: Also known as monogramming, embroidery uses cotton threads to recreate a design on a garment by stitiching into the garment. Embroidery is commonly used for a logo on the left chest of a garment such as a work uniform polo or jacket as well as on sports uniforms. What you need to know: Embroidery gives a great, professional look to any garment. Your design can be up to 22x22cm in size and contain up to 12 colours. Embroidery is also ideal for customising caps and bags. 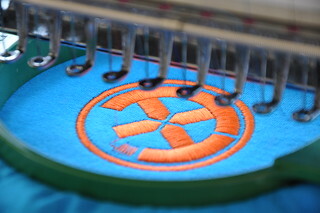 Set-up: Before we can embroider, your design will need to be digitized. This is a process to tell the machine where to place each stitch. Konstruct provides a competitive in-house digitizing service. Pricing: Price is determinant on the number of stitches in the design and the number of garments being embroidered. The bigger the design, the more stiches there will be. A one-off fee for digitizing each design may apply but we'll try to give you an all-inclusive price. Once digitized, we will store your design for future use, saving you time and money. What it is: Digital printing involves a computer generated image being printed directly on to a garment (direct-to-garment printing) or promotional product or on to special transfer paper and then transfered on to the garment. Digital printing can provide a great quality print but generally not as long lasting as a high quality screen print. What you need to know: Digital printing is great for one-off or low runs. Your design can have unlimited colours and complexity and does not need to be converted in to a "vector" graphic meaning setup is easy as! Your print can be up to A3 (297 x 420mm) in size on a garment. Set-up: There is basically no special set-up required for digital printing. Any computer image can be used! Pricing: Digital printing can be a bit more pricey than other print methods but this reflects that it is ideal for one-offs. What it is: Vinyl transfers are computer cut vinyl that is transfered via heat press on to the garment. This is typically used for names and numbers on sports apparel. What you need to know: Vinyl transfers can only be achieved using a computer file in "vector" format. Usually vinyl transfers are only used for text. Set-up: Typically set-up is as easy as letting us know the name or number you want on you apparel. Pricing: Vinyl transfer is a cost effective method for adding different text/numbers to you gear. What it is: Sublimation is the process where special transfer paper is printed with a design to cover an entire garment. The fabric used to make the garment is then transfered in to the fabric using heat. Once this is done then the garment is sewn together. What you need to know: Sublimation gives great results for sports teams and other garments where full customised colours and designs are required. Because the sublimation takes place before the garment is even sewen together the lead times are longer than other print methods and typically 3 - 4 weeks lead time is required. Set-up: Sublimation requires a full design of the garment being created with colours and logos in "vector" format. We have a great range of standard garments to choose from or we can custom design one for you. Pricing: Sublimation is cost effective for orders as small as 12. Pricing is typically more than an off-the-shelf screen printed garment but this reflects the full customisation available.